See picture in one of the posts below for potential 15% discount code. I always buy my tyres from, what I believ is. their online sales arm …I always buy my tyres from, what I believ is. their online sales arm tyreshopper. Way cheaper than National but you still get them fitted at National Tyre Centers. I tried through tyreshopper but seems there is no option to put voucher code on their website. This makes National Tyres prices cheaper. Additionally use DV127 Code to get 1/2 price tracking. Both codes work together. Not bad at all, their the same price as asda tyres, without the 10% savings off the code. Sadly they don't have any cheaper options. Thanks OP. You just saved me £40 and they were the cheapest anyway before the discount. I always buy my tyres from, what I believ is. their online sales arm tyreshopper. Way cheaper than National but you still get them fitted at National Tyre Centers. Thanks OP, a small but welcome saving of £8 thanks to you. Have a great weekend! I tried through tyreshopper but seems there is no option to put voucher …I tried through tyreshopper but seems there is no option to put voucher code on their website.This makes National Tyres prices cheaper.Additionally use DV127 Code to get 1/2 price tracking. Both codes work together. I didn't think you woudl be able to use the code. Its just that when I've been looking for tyres in the past Tyreshopper has been way cheaper than National. For example, I bought a couple of Goodyears for my wife's car at £55 each. National wanted £96 each. Edit: Actually, just checking prices and National seem to be more competetive than they used to be so definitely worth using the voucher. Just got myself 4 Avon ZV7's with tracking for £264.83 and then got 3% quidco too...It's not bad going...Worked out all in around £65 ish a tyre which is good going! Autocentre? Is that Halfords Autocentre or F1 Autocentres please? I don't go near my local National in Kendal. I booked online for an oil change and when I turned up, I was told it couldn't be done as both ramps had cars on that couldn't be moved for the rest of the day. Walked past 20 minutes later to find same guy, sat on an empty ramp smoking a fag. When they eventually did it, the oil warning light was on 2 days later as they hadn't put enough oil in. Having said that I would still use a different branch, but would insist on watching the work being done. Thanks for this, gone for a set of Crossclimate+ I've not seen a better price fitted. 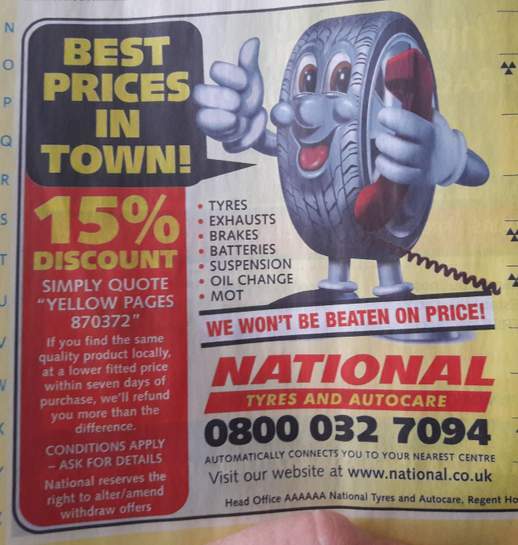 The bad reviews seem to mostly relate to servicing etc... so hopefully they can manage to put the tyres on the wheels ok.
Used the 15% discount to get almost £17 off each tyre. I hope the cashback pays out too. 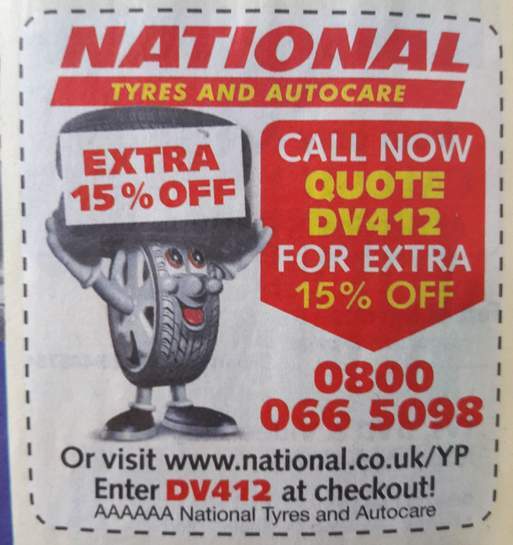 Cheers.Used the 15% discount to get almost £17 off each tyre.I hope the …Cheers.Used the 15% discount to get almost £17 off each tyre.I hope the cashback pays out too. Reckon the chances of cash back are slim going by the reviews on Quidco. Cheers. Just used the 15% off code to save £43 quid. EDIT: scrap that seems DV412 still works and gives over 10% but only works in Chrome, in Opera shows only 10% off, what a weird bug. Thanks OP you saved me a bunch. Saved £17. Thank you !! !